18k white gold, blue topaz and diamonds ring,1.40 ct diamonds. Astounding blue elegance! 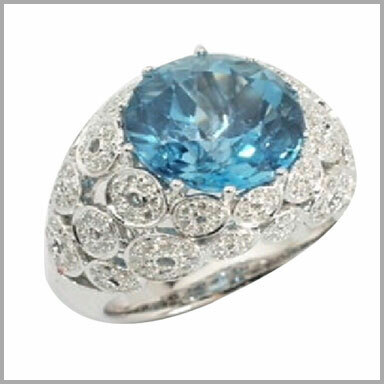 Crafted in 18K white gold, this ring features one round shaped 10mm blue topaz in an ten-prong setting at the center. There are also 192 round cut diamonds in beads settings around and down the shoulders. The total blue topaz weight is 8.00ct and the total diamond weight is 1.40ct (both approximate). The diamond color is H and the clarity is SI2.